Chitrangana, India’s biggest eCcommerce consultancy, believe the online industry has regained momentum after a drop off in 2017 in the aftermath of demonetisation. Chitrangana, industry experts in the e-commerce sphere, have projected a 45% growth on YOY basis for the 2018-19 season, just a year after the web retail business saw a drop off due to demonetisation of Rs. 500 and Rs. 1,000 notes. 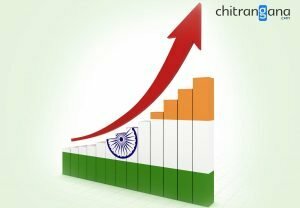 Chitrangana believes the extraordinary growth in 2018-2019 is also due to comparison with 2017’s negative growth due to demonetisation, which built up a deficit in the previous fiscal. At the time of demonetisation, a few e-commerce giants reported a steep fall in sales, mainly due to fewer Cash on Delivery (CoD) orders. However, Chitrangana is convinced that fresh shoppers from tier 2, 3 cities will amount to a minimum of 25 percent growth in the industry. The consultants cited the mobile internet revolution for the growth of new customers in the blossoming e-commerce industry. The report also projected a 7% rise in customer base in metro cities, which will add up to a sizeable 15 percent growth for the fiscal year 2018-19. Mr. Nitin Lodha, a veteran e-commerce consultant, believes the market is no longer negatively affected by underperforming and amateur start-ups that reportedly ruined the e-commerce experience with “unprofessional practise.” Mr. Lodha reckons the market is now filled with only serious players that are focused on a customer-first policy, making it easier for fresh consumers to avail their services. The Research and Survey team at Chitrangana expect 2018 to be a golden year for specialised eCommerce startups and regional eCommerce model. Mr. Neeraj Jain, head of the Research and Survey unit, is of the opinion that start-ups should keep themselves from selling multiple categories, and instead focus on specialised categories. Mr. Jain emphasised on start-ups sticking to a regional model with focus on selling specialised categories, as opposed to offering various products to compete with established e-commerce firms. Through its new draft e-commerce policy, the Govt. of India is determined to level the playing field for Indian start-ups in their battle against established overseas giants. The policy, recently drafted by India’s Department of Consumer Affairs, is heavily tilted towards domestic firms. The new draft e-commerce policy has reportedly recommended severe restrictions on online retain, including fewer discounts. Industry experts believe the policy could prove as a deterrent to the global e-commerce giants. Chitrangana believes the 45% growth on YoY basis is only the tipping point to the golden age of eCommerce in India. The new draft policy is expected to give rise to more regional start-ups.